From his headquarters in Lafayette, Indiana, Steve Anderson’s Surface Testing Group evaluates concrete floor slabs for excess moisture. By doing so, he is able to save flooring contractors, general contractors, and commercial building owners in the Midwest tens of thousands of dollars from moisture-damaged floors. 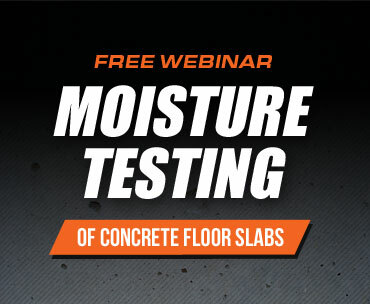 His approach is highly effective: Test concrete slabs for moisture before flooring is installed. 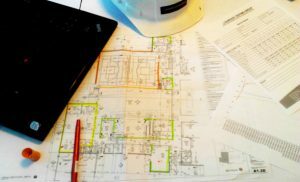 When his test results are within product specifications, contractors have the green light to proceed with installation. In order to avoid disastrous flooring failures, Anderson’s approach makes good common sense. Problem is many contractors, architects, and owners are not testing for moisture. Or, they’re using unreliable tests. And that’s what caught Anderson’s attention. “After 30 years in the floor covering business, what really rocked me was reading a statistic that said flooring contractors, architects, building contractors, and owners were paying more than $1 billion annually to resolve flooring failures due to concrete moisture issues,” he declared. Sensing a need in the market for concrete moisture testing, Anderson began talking to people in the flooring industry. He discovered many of them did no concrete testing. “They gave a lot of reasons why they didn’t. And many who did test used methods inferior to the RH in situ type testing,” he said. This prompted Anderson in 2011 to start Surface Testing Group. That first year was difficult. To drum up business, he had to get out and educate lots of industry folks about the merits of concrete testing. But the more he talked to people about it, the more they realized the need for concrete moisture testing. During that time, Anderson developed and refined all the necessary processes to make his business sound and marketable to clients. 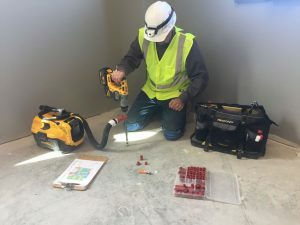 “I had to come up with the right processes for properly assessing concrete slabs, providing easy-to-read reports on our test results, and ensuring that everything we did was done in a timely, efficient manner so as to be affordable,” he noted. Anderson’s business has come a long way from those early days of struggle. 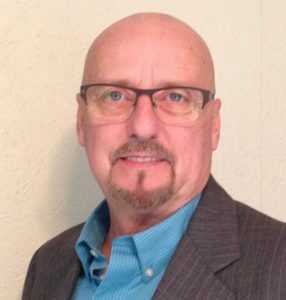 Today, he gets plenty of business from referrals, word-of-mouth, and sales efforts, including doing PowerPoint presentations with flooring contractors, architects, and general contractors. When Anderson started the business, he looked closely at all the moisture test products in the market. “I wanted a test that was accurate, reliable, and easy to use. I found only one test that met all my criteria – Wagner Meters’ Rapid RH® 4.0 EX single-use sensors. “I especially liked the fact that with the Rapid RH® 4.0 EX, I didn’t have to deal with calibration, calibration checks, and the record keeping of those checks as mandated by the ASTM F2170 standard. At the time, Wagner was the only company that offered a full-use product where you just insert a sensor into the concrete slab and do not have to remove it later. “I also liked the idea of having a NIST-traceable calibration certificate for each sensor. It made the compliance paperwork very simple and easy,” Anderson said. Later, when Wagner introduced its Rapid RH® 5.0 with reusable sensors, Anderson decided to switch from the 4.0 EX to the 5.0. Anderson admitted that when he first started his business he shied away from using reusable sensors because he didn’t want to deal with labor-intensive calibration checks, especially since he conducted a high volume of tests. “That’s what I really like about the reusable 5.0. It makes the process of checking calibration a lot easier. 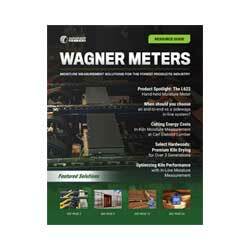 “In fact, with Wagner’s CalCheck, I can test 25, 30, 40 sensors at one time. That’s something you can’t do with other products out there unless you have 25, 30, or more calibration check devices,” he said. Since record keeping is essential in his business, Anderson also appreciates how the Rapid RH® handles that. “With other systems, you have to manually record data with pencil and paper, writing out the serial number, date, and test results. With this system, we don’t do that because everything is recorded automatically by the Smart Reader. I just connect the Smart Reader to the sensor and immediately the data is sent wirelessly to the DataMaster™ app and the report is always there,” he noted. And while this process is easy to use, Anderson especially likes the fact that the data is protected against any human error. The DataMaster™ app does everything automatically – even sending data to Wagner’s ASTM F2170 report analysis website, F2170reports.com. And, with the DataMaster™ app, Anderson can use his phone to access data from any past job. As with any product, if it’s used often enough problems can occur. That happened once when Anderson’s Smart Reader wasn’t able to communicate with his hand-held unit. After explaining his dilemma to Jason Spangler, Wagner Meter’s Flooring Division Sales Manager, Spangler was on a plane the next morning to the job site. “It was an awesome display of customer service,” exclaimed Anderson. “Jason resolved the issue. He also gave me a newer version of the Smart Reader and shipped me another one as well. “I was really thankful that he took the time and cared enough to personally fly out to take care of my problem. Some companies look for reasons not to do things like that, while Jason and Wagner Meters look for reasons to do things like that. They’re always wanting to improve their products and wanting to know if there are any issues in the field,” he said. 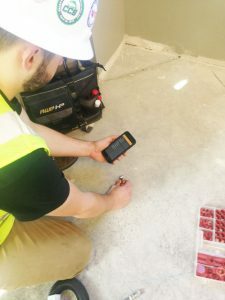 Looking three to five years into the future, Anderson believes his business will continue to grow – allowing him to expand geographically – as more people become aware of the need for concrete moisture testing. “I think the percentage of ASTM-compliant concrete moisture testing is still too low compared to the amount of moisture-sensitive products being installed today. So I think we’ll continue to generate greater awareness of concrete moisture issues and the need of proper ASTM-compliant testing,” he said. “We’ll also need to overcome the bias of some people who see moisture testing only as a means for flooring contractors to make up on lost profits when bidding too low on jobs. “But that’s why independent, unbiased, third-party companies like mine are the way of the future. We can be a valuable resource for the flooring industry in the years ahead by helping contractors and building owners avoid the high cost of repairing damaged flooring and remediating concrete slabs that have high moisture,” he added. Anderson also believes that in the coming years new concrete mix designs will be introduced allowing concrete to dry quicker because of lower water-cement ratios and other factors, and that new technology from companies like Wagner will allow him to offer new and even better services for his clients.